Grandview Veterinary Clinic has a skilled team of veterinarians who welcome you to our practice. We proudly serve the Odessa area. At Grandview Veterinary Clinic, it is our daily privilege to provide quality vet care to your cherished pet, with compassion and competence. We hope to ensure a positive impact on our patients, pet owners and the local community. Dr. Garcia came to us in May of 2015 from San Antonio, TX. She attended Ross University School of Veterinary Medicine on St. Kitts, in the Caribbean. Despite all her travels, she is still an Aggie at heart, having completed her Bachelor’s Degree at Texas A&M University. 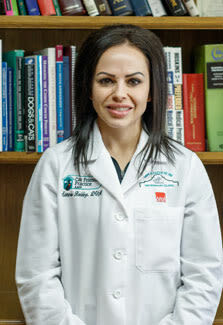 Dr. Garcia and her husband have a beautiful son named James and are parents to 2 four-legged children-a tabby cat named Ribbon and an Aussie mix named Bow. She has a particular interest in feline internal medicine and behavior, as well as surgical procedures. She is a Feline Advocate for our Certified Feline Friendly Practice. In her spare time, she enjoys reading, crochet, and watching exciting TV series. We are very happy to have her be a part of the Grandview Family. Dr. Sammie Redding grew up on a farm in Wheatland, Wyoming. As a child, she was always around the family pets from dogs and cats, to horses and cows. At a very young age Dr. Redding was given the chance to work at a veterinary clinic in her home town where she was able to work her way up and soon found her passion was truly that of becoming a veterinarian. After high school, Dr. Redding attended the University of Wyoming where she received her Bachelors Degree in Animal and Veterinary Sciences. Dr. Redding was then accepted to Oklahoma State Veterinary Health Sciences in Stillwater, Oklahoma to pursue her life long dream. After graduating from Oklahoma State, she moved back to Wyoming where she worked for a mixed animal practice for several years. Dr. Redding, ready for a new journey, moved to Texas, worked in Weatherford for a year and is now happy to join the Grandview Veterinary Team as an Associate Veterinarian. She takes special interests in preventative health, internal medicine and surgery. In her spare time, Dr. Redding loves to spend time outdoors hunting, fishing, hiking, and horse back riding, although she knows these hobbies will change due to the lack of mountains in the flat land of Odessa, Texas. She also enjoys bike riding, gardening and drag racing. 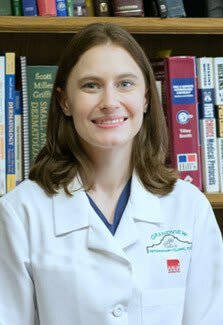 Dr. Redding can’t wait to offer her services at Grandview Veterinary Clinic and looks forward to meeting new people and their fur babies.